In this imaginative leap into the future, the writer envisions a Budget speech delivered by the Finance Minister 50 years hence. "Madam Speaker, I beg to move that Parliament approves the financial policy of the Government for Jan 1, 2065 to Dec 31, 2065. Our economy has been doing well. Real-time estimates show that gross national income (GNI) has grown by 2.1 per cent and gross domestic product (GDP) by 1.8 per cent year-to-date. Our GNI is now 25 per cent larger than our GDP. Unemployment is 0.5 per cent, the lowest since the Global Cyber Crisis of 2052. The prognosis for 2065 is good, with both the offshore and territorial economies expected to do well and yield GNI growth of 1.8 per cent and GDP growth of 1.6 per cent, closer to underlying potential. Demand in the US, India and China - our three largest markets - will help to sustain activity in the Asean Free Economic Zones (AFEZ), from which our corporations and citizens derive 40 per cent of their incomes. The production of space vehicles and supersonic jet engines will continue to be the main sources of growth in the AFEZ. Additive manufacturing of components for electric cars and fusion reactors will do reasonably well despite stiffening competition from new plants in Mexico and Brazil. But the assembly of "Nightingale Robots" will continue to contract as Germany, France and the UK join Japan in banning their deployment pending further tests, following the Robot Riots in Tokyo's Central Hospital two years ago when hackers gained control of these robots. 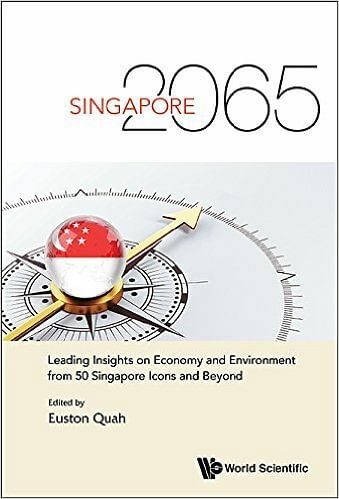 • This is an excerpt from the book Singapore 2065: Leading Insights On Economy And Environment From 50 Singapore Icons And Beyond. Edited by Euston Quah. Published by World Scientific Publishing Co. The book is sold through the publisher's website at $79 for the hardcover version and $35 for the soft cover. It is also available at leading bookstores. Activity within the territorial economy will be underpinned by healthcare R&D, digital finance, and the smart industry. Genome sequencing for disease control, infrastructure financing of the Sino- Indian lunar complex, and global supply chain management are expected to be the main sources of domestic output growth next year. Let me highlight the Government's expenditure priorities for the coming year. We will upgrade our retirement villages in Malaysia, Thailand, Indonesia and Western Australia. We will step up investments in the tele-medicine infrastructure and mobile-nursing programme to enhance healthcare support for less mobile elderly Singaporeans. We will build another six nursing homes and Alzheimer's Centres over the next 10 years; Alzheimer's care has become the fastest-growing expenditure item, with one in 12 Singaporeans affected by this condition. Subsidies for MediShield Life premiums will continue to increase. Over the last 25 years, we have been steadily shifting the weight of government spending from pre-employment training (PET) in the formal school system towards continuing education and training (CET). We will increase the paid CET leave from four weeks to six weeks per year and increase the annual CET subsidy to 50 per cent. The only portion of the PET budget that will continue growing is for special needs education, especially for early intervention treatments and training in life-readiness skills for our autistic children. Next year, we would have completed the third and final phase of the Dyke Construction Programme, which we began in 2045 as a defence against the rise in sea levels. The Escalator and Travelator Upgrading Programme will be completed next year, enhancing the urban mobility of elderly Singaporeans. We are also on track to reach our target of placing underground 90 per cent of our urban retail space and 60 per cent of our road network, as envisioned in the Underground City Master Plan of 2055. With the completion of our second offshore nuclear power plant, spending will begin to taper from next year. Expenditure related to climate-change adaptation will stay elevated in view of the continuing adverse effects of global warming. With the depletion of tropical farms in the region, we will expand our footprint of organic food and fish farms in Australia. We will also upgrade the Jurong Island Recycling Complex to better utilise the defunct petrochemical facilities. We will enhance connectivity with the three million Singaporeans living and working in the AFEZ, China and India by upgrading the video capabilities of the current networks. We will organise more programmes to better integrate the two-million-strong expatriate community within Singapore. We will start preparations for the Olympic Games to be jointly hosted by Malaysia and Singapore in the Iskandar Economic Zone in 2068 - a fitting way to commemorate the 40th anniversary of Iskandar's "Two Country/One System" model. We will also increase outlays to support the growing number of Singaporeans volunteering to help teach poor children, promote health education, and build irrigation facilities, under the SingCare Programme for Sub-Saharan Africa. Resources will continue to be focused on building infrastructure in our offshore satellite towns and industrial parks in the AFEZ to cater to the needs of our multinational companies and overseas communities. We will also enhance the cross-border infrastructure to strengthen linkages between the territorial and offshore economies. Next year, we will reach the long-term targets set in the 2050 Report of the Sustainable and Equitable Taxation Commission (SETC), which called for Income and Consumption taxes accounting for 30 per cent each of total revenues, and Wealth taxes and Net Investment Income accounting for 20 per cent each. As members would recall, the Constitutional Amendment of 2052 allowed for up to 75 per cent of net government investment income to be used for the Budget. The Corporate Income Tax rate will remain unchanged at 14 per cent. The Personal Income Tax will also remain unchanged, with the top marginal rate at 20 per cent and the minimum taxable income threshold set at the median income of the population and subject to a 3 per cent rate. Wealth inequality has become the key socioeconomic challenge facing us, compared to income inequality 30 to 50 years ago. We will increase further the progressivity of our wealth taxes, to help enhance social mobility. Properties with Annual Value exceeding $2 million will be subject to a higher Asset Tax rate of 30 per cent. The Capital Gains Tax, currently at a flat rate of 10 per cent, will now comprise two tiers: 10 per cent for gains up to $1 million and a marginal rate of 15 per cent for gains above this level. Finally, the top tier of the Inheritance Tax, applicable to bequests received in excess of $20 million, will be raised to 30 per cent. Twenty years ago, growing subsidies for MediShield Life premiums outstripped our ability to pay for them. The President turned down the Government's request to draw down the reserves and called for a sustainable financing plan for healthcare. This led to the Constitutional Amendment of 2046 that limited the budget of the Ministry of Well-being to receipts from the Goods and Services Tax (GST). This discipline has served us well. The last increase in the GST rate was five years ago. With Alzheimer's care and MediShield Life premium subsidies rising rapidly, I will increase the GST rate to 14 per cent next year. The Carbon Tax will remain unchanged, at $140 per tonne of carbon. Since its introduction in 2030 following the Global Climate Change Mitigation Compact, it has helped to reduce greenhouse gas emissions. It also helped to replace revenues lost when we discontinued the old motor vehicle taxes and vehicle quota system with the advent of the centrally managed driverless car-pooling system in 2042. Madam Speaker, next year, Singapore marks 100 years as a sovereign country. We took birth in 1965 as an improbable nation, achieved First World status by the time we celebrated our Golden Jubilee in 2015, and are today one of the top five cities in the world. We have come this far because we worked hard, we worked together, and we worked for the future. And we lived within our means. Fifty years ago, our third Prime Minister, Mr Lee Hsien Loong, spoke about the need to balance a warm heart with a hard head. And that is generally what we have achieved." • The writer is managing director of Monetary Authority of Singapore.